'Lost in Yonkers' runs Friday–Sunday through April 15 at the Raven Performing Arts Theater. 115 North St., Healdsburg. Friday–Saturday, 8pm; 2pm matinee, Sunday. $10–$30. 707.433.6335. 'The Time of Your Life' runs Friday–Sunday through Apr. 15 at the Cloverdale Performing Arts Center, 209 N. Cloverdale Blvd., Cloverdale. Friday–Saturday, 7:30pm; Sunday, 2pm. $12–$25. 707.894.2214. 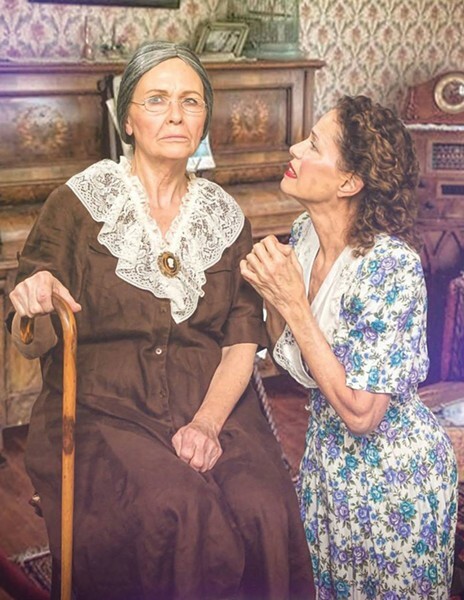 MEAN OLD LADY Grandma Kurnitz (Trish DeBaun), left, is the opposite of sweet Aunt Bella (Priscilla Locke). Two Pulitzer Prize–winning dramas have hit North Bay stages. The first is the Raven Players' production of Neil Simon's Lost in Yonkers. Simon, whose best-known works are comedies tinged with a little melancholy (The Odd Couple, The Sunshine Boys), won the 1991 Pulitzer for Yonkers, a melancholy family drama tinged with comedy. With their mother deceased and their father working to pay off a loan shark he owes for covering his late wife's medical bills, Jay (Ari Vozaitis) and Arty (Logan Warren) find themselves living for 10 months in 1942 with their tyrannical grandmother (Trish DeBaun) and their mentally challenged Aunt Bella (Priscilla Locke) in Yonkers, N.Y. Grandma Kurnitz is cold, demanding and unable to express affection. She does not want the children there, but Bella does. The battle is on, first between Kurnitz and her grandchildren, but ultimately between mother and daughter. Director Joe Gellura has a strong ensemble at work in this piece, with laughs generated by Warren as Simon's alter ego. The key performance is delivered by Locke, excellent as the daughter simply looking for a little happiness in her life. It's a sensitive performance that grounds this show and gives it more heart than one expects from a typical Simon play. The second prize winner is The Time of Your Life. There may be no more "community theater" in our area than the folks at the Cloverdale Performing Arts Center. A glance through the bios in their programs shows a mix of trained veterans, community actors and a fair number of newcomers. This willingness to cast from the community, while commendable, often leads to a variance in quality. The center's current presentation of William Saroyan's prize-winning, but severely dated, Time of Your Life is a good example. The show, a sort of pre-WWII Cheers, has a cast of 16 with various levels of experience playing the denizens of a San Francisco dive bar circa 1939. There's no real plot, just a variety of human flotsam and jetsam floating through the tavern. In an early scene, one character asks another if a performance they're watching is any good. The response: "It's awful, but it's honest and ambitious." I can't improve on Saroyan.